The industry is focusing its attention on LED lights market growth performance in 2014. The demand for LED lights will surpass that of LED backlight during the beginning of 2014, according to a recent report by J.P. Morgan. The scattered LED lights market is rewriting market game rules. LED factories are hoping to overcome consumer congestion which led to limited bargaining space. With the arrival of a new era in LED lights, manufacturers hope to enjoy more stable gross profit performance and larger space for price negotiations. 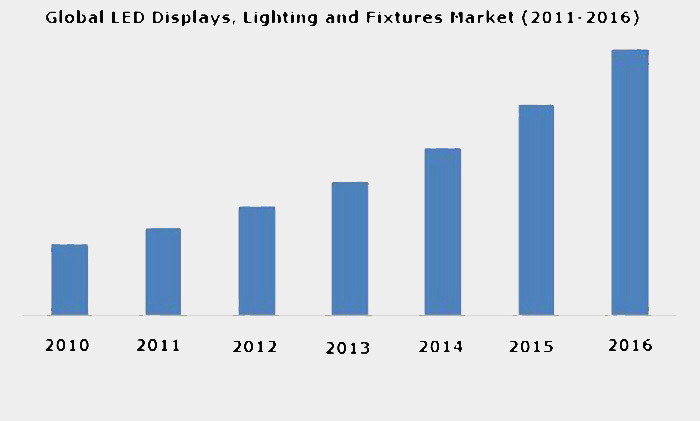 LED lights demand is estimated to surpass that of LED backlight in 2014. LED product price drops have contributed largely to increased consumer usage, said the financial service firm. Current payback time for commercial luminaries A19 and PAR28 has already been reduced to a year or less. LED bulb price has room to drop 30 percent by 2015 which will attract more consumers to replacement LED bulbs economic benefits. The LED industry welcomes the new lighting era. J.P. Morgan forecasts penetration rate in Nov. 2013 will reach around 11 percent, and only reached 5 percent last year. LED lights penetration is hoped to be over 20 percent before 2015. LED lights demands will bring structural changes to the LED industry, said J.P. Morgan. The LED lighting market is more sparse than the LED backlight market where consumers are highly concentrated. The top three global lighting manufactures Philips, Osram, and GE make up 30 percent of the global market share. This scattered nature of the LED lights market will bring more revenue and bargaining space than LED backlight products in the past.